From Boudicca to the Amazons, historian, author and broadcaster Bettany Hughes uncovers the truth behind some of the most famous warrior women in history. Boudicca was one furious woman. Roman sources tell us that to intimidate this native Briton and the Iceni tribe of whom she was leader, the order was given that Boudicca should be flogged and her young daughters raped. Originally Rome’s allies, the Iceni formed one of the client kingdoms that signed up to the Roman project in return for protection and trade deals. With flinty greed, Rome then challenged the will of Boudicca’s husband, Prasutagus, who had left half the Iceni land to his two daughters. 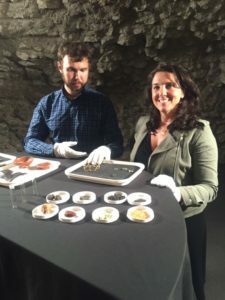 Bettany Hughes and the Fenwick Hoard. The heat of Boudicca’s anger was made flesh. We’re told the defiled, humiliated queen strategised her rage and persuaded others to join her to try to push Rome out of Britannia. The Fenwick Hoard, recently discovered in Colchester (when the Fenwick building there was being renovated), is packed with tragic treasures – dates, lentils, mustard seeds, flash-burnt by the fires of those who, along with Boudicca, incinerated the city. St Albans, London and many settlements in between fell too, as Boudicca set about with sword and flame to undermine Roman rule. But there’s an issue with Boudicca’s warrior-woman wonderfulness. We know about this tribal queen mainly from Roman sources. Focusing on her appearance, a century later Cassius Dio described her tawny hair down to her hips, her flashing eyes and strident voice. Boudicca was represented, and thus perceived, as a kind of gorgeous, anti-superhero. Her extra-specialness was promoted as the reason she gave the Romans a run for their money. Marble frieze from The Mausoleum at Halicarnassus, also known as The Amazon Frieze. Ancient Greece, c. 350 BC. The same applies when it comes to the Amazons. Although they have been judged through time to be a quasi-mythical race of warrior women, who only slept with men to acquire warrior offspring –who founded cities, drank fermented mares milk and rode with one breast-bare – archaeological and historical research now suggests these were real, flesh-and-blood female fighters from the tribes of Scythia and Sarmatia. Given that their central skill was horseback combat, which requires not just muscular strength but strategy and multitasking, the success of these ‘Amazons’ becomes easier to comprehend. Buried with jewellery including bracelets made of fox teeth, these fighting women have fingers bent by archery and bowed legs from a lifetime of riding, and were sometimes buried in a riding position. New DNA evidence suggests that as many as a third of the warrior graves from 100 BC–AD 500 could belong to women. 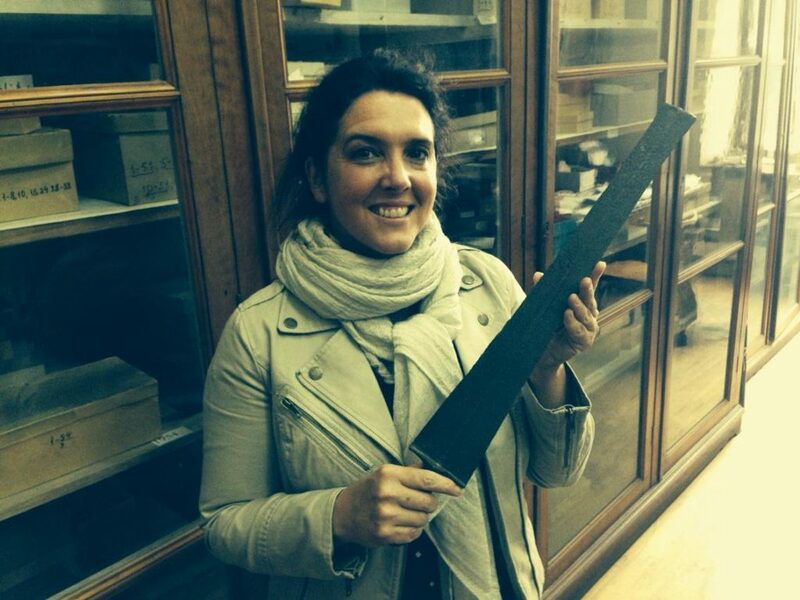 Bettany Hughes with an Amazon sword, c. 1000 BC, behind the scenes at Georgia’s National Museum. Image: @bettanyhughes. A couple of years back I was lucky enough to get behind the scenes at Georgia’s National Museum. I’d heard that a number of warrior graves containing women, buried with weapons, had recently been identified. And when I say a number, we’re talking 800. The brilliant chief archaeologist led me to the storeroom and pulled out a series of 19th-century wooden drawers. Wrapped in brown tissue paper, inside was one woman’s hand, ring intact, and an almighty sword. Holding that sword I felt to be in two times at once. Imagining the rage or fear of the women who originally wielded such armaments – women who would, quite rightly, be outraged to discover that for centuries their real battles had been demoted to the realm of mythology and fantasy. 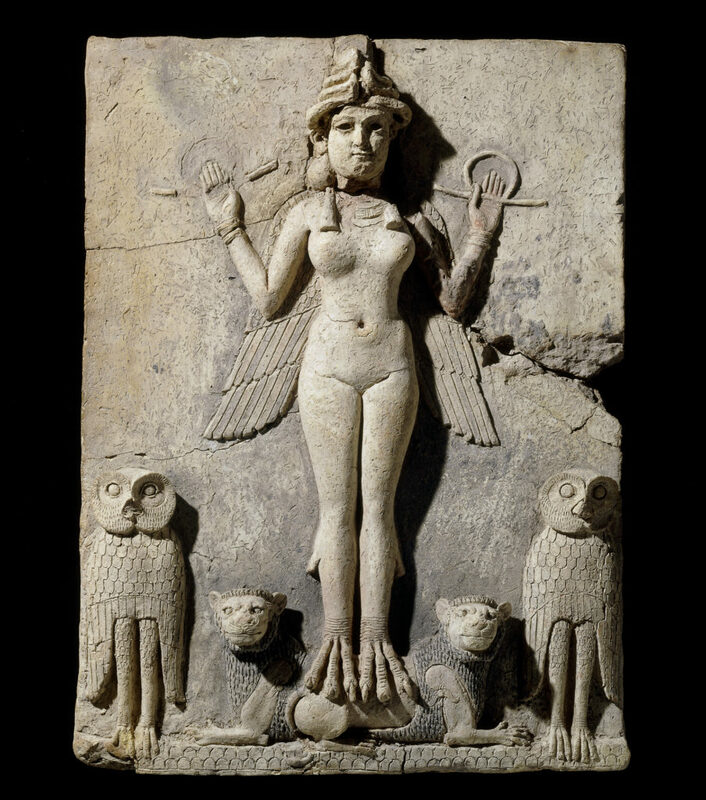 The Queen of the Night relief. Old Babylonian, 19th–18th centuries BC. Not in strength are we inferior to men; the same our eyes, our limbs the same; one common light we see, one air we breathe; nor different is the food we eat… why then are we denied what is bestowed on men? It is Shylock’s plea a millennium before Shakespeare’s The Merchant of Venice, and one as cogent in the 21st century as it was in antiquity. Bettany Hughes’ latest book is Istanbul: A Tale of Three Cities, published by Weidenfeld and Nicholson, and her film Venus Uncovered produced by Sandstone Global is available on BBC iPlayer. Her Eight Days That Made Rome featuring Boudicca is on Channel 5.